I was so honored to get to go on a 10-day trip with a group of influencers, hosted by the . I had high hopes and big visions of being able to blog and Periscope on the trip, but between our jam-packed itinerary, jet lag, very long days and short nights, and somewhat sporadic internet, I spent all of my spare minutes catching up with my family, taking care of basic business details, and sleeping. I arrived back home late last night and am SO glad to be home. But I’m also so grateful to have had the opportunity to go on this trip. I was stretched. I met very interesting people who have done amazing things with their life. I had many highs and lows. And I came home inspired, re-energized, and ready to fully embrace life. 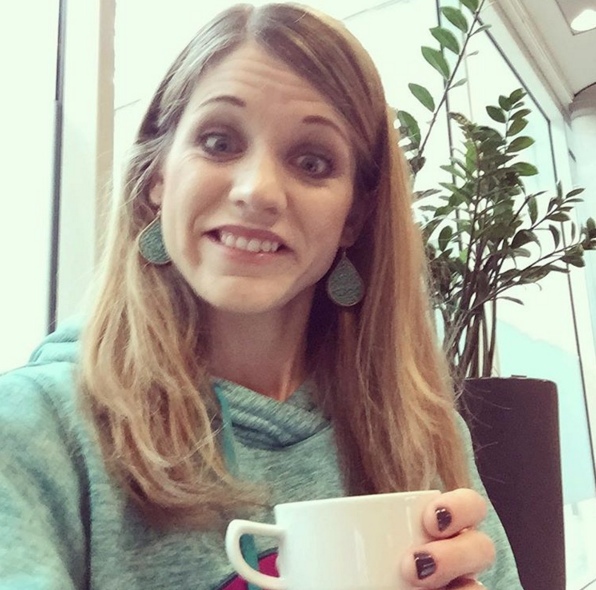 I struggled to sleep on the flights over and only ended up getting about an hour of sleep total, so I was thankful to get some good, strong coffee at the airport! 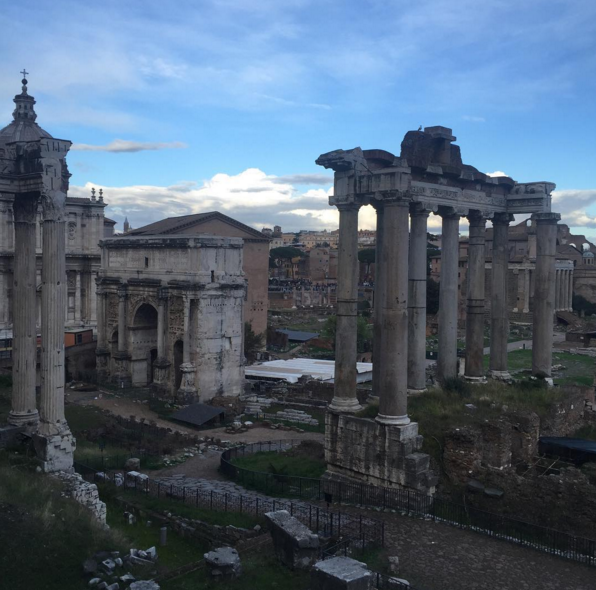 We landed in Rome and met up with some of our group and then headed to our hotel to have a few hours to rest, relax, and get ready for the busy days ahead. 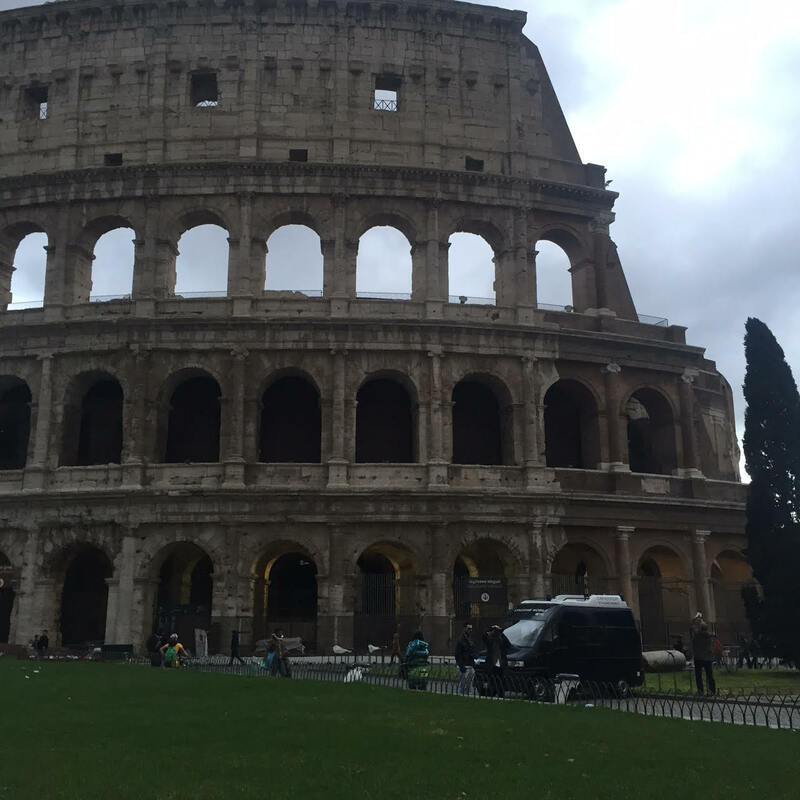 I was grateful to get in a short power nap before we met up with all of the group in the lobby and headed out to see all sorts of historical sites and hear more about the history of Rome. The group of folks on the trip was very diverse as far as religious beliefs and backgrounds go and I quickly realized that was going to add a very interesting flair to the trip. We got to be exposed to so many differing beliefs and viewpoints and it really made things much more interesting and thought-provoking, as a result. My favorite part of the first evening was getting to see the Coliseum. After reading about it and seeing pictures of it for so long, getting to actually see it in person was thrilling. I guess I knew that Rome is a city rich with history, but I never really grasped what it would be like to be met with so many buildings and monuments and parts of old buildings at every turn. It was so interesting to see the layers of buildings and how buildings have been built upon each other over the years. The richness of history, the stories that took place here, the famous landmarks all around us… it was almost overwhelming. After walking the streets and feeling pretty chilled from the rain, our last stop before dinner was the Trevi fountain. There were LOTS of people there, so I never ended up getting a good picture, but it was fun to see. We ate dinner as a group at a very authentic Italian restaurant and then walked back to the hotel after 10 p.m. I quickly realized that this trip was going to be much more fast-paced and high intensity than I realized. I knew it was going to be full, but I didn’t realize that we were going to be gone all day long and going really, really intensely all day long. I also didn’t realize how much we were going to be walking or how cold it was going to be at times. I decided that I needed to make sleep and self-care a priority instead of getting in the blogging and scoping I’d hoped to do. I knew that that was the only way I was going to survive (and hopefully — mostly — thrive) 10 days of going, going, going with a large group of people whom I didn’t really know. Rome is such an amazing city! We were there this time last year to visit our daughter, who was studying there for the semester. Seeing history up close was an adventure I’ll never forget – and I don’t think I’ll ever forget how much my feet hurt from walking a million miles either lol. 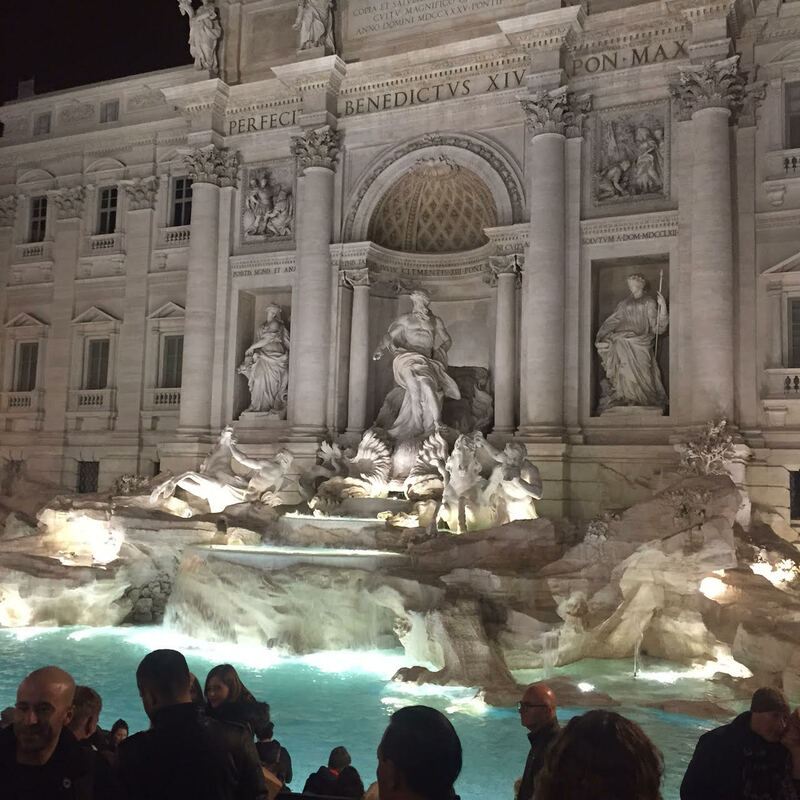 I love your picture of the Trevi fountain! It was still undergoing renovation when were there and was covered in scaffolding. It’s so beautiful! Yes! I so get the feeling like you’ve walked a million miles! I am looking forward to hearing more about your trip. 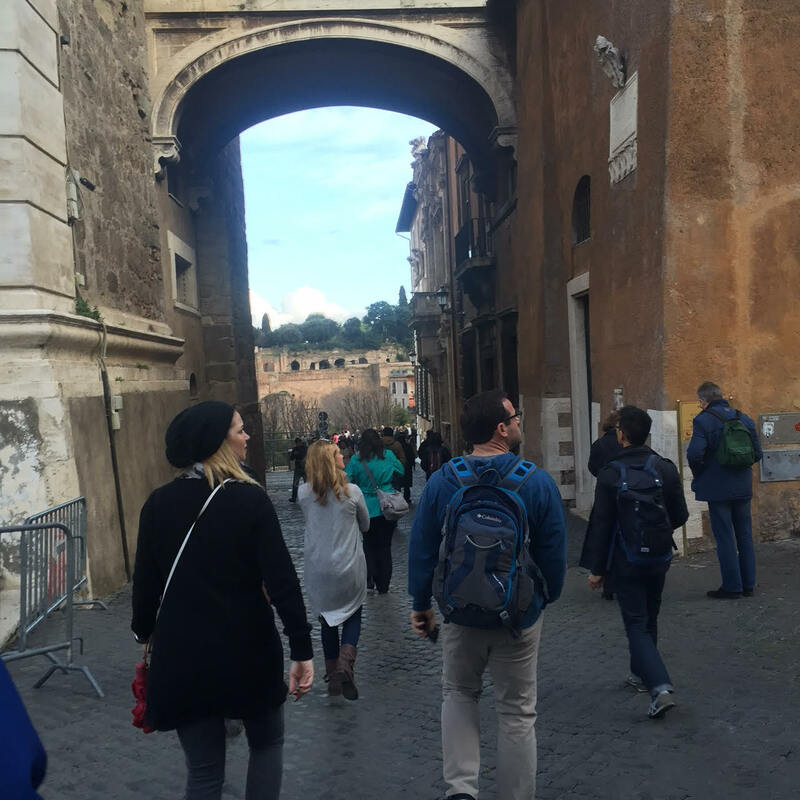 I am so glad you got to go on this trip and experience Rome and Israel. Crystal, you’re right. The Germans are MUCH quieter than Americans. I live in Germany and it was the first thing my family and I noticed when we moved here. Even the subways and restaurants are very quiet. Sounds like such a great time! I can’t wait to hear more, but 3 hours of sleep had to be a challenge! This is bringing back so many memories from my trip to Europe with my sister 15 years ago. Love it! Oh fun! I’m glad you were able to visit Rome!